For the Fall 2011 semester, Gunnar Hand, AICP instructed the Urban Planning and Design 410 (UPD 410) studio at the University of Missouri, Kansas City. As a senior-level studio, the students worked on the project with a real world client, the Harry S Truman Coordinating Council (HSTCC). HSTCC is the regional planning council for the Joplin metropolitan area. 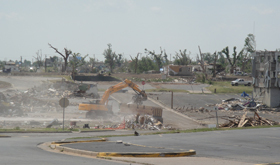 With its regional scope, the Studio worked with its client as well as the Cities of Joplin and Duquesne, the Joplin Area Chamber of Commerce, the Citizens Advisory Recovery Team (CART) and FEMA to assist with the development of a community vision for a more resilient Joplin. The project focused on the development of three redevelopment alternatives, a two day CART sponsored design charrette hosted by the American Institue of Architects (AIA), a final jury review at the Kansas City Chapter of the AIA’s offices, and a final presentation to all stakeholders in Joplin. The final product of the studio was the development of the Rebuild Joplin Plan, a comprehensive vision for a more vibrant, sustainable and resilient Joplin. The students were challenged to face the harsh reality on the ground of a disaster recovery site, navigate the local politics of rebuilding, and design a recovery plan that could go beyond a “new mormal”, but potentially shift the status quo of planning and real estate development in Southwest Missouri. For more information about UMKC’s Architecture Urban Planning and Design Department (AUP+D) and this Studio, please click here. 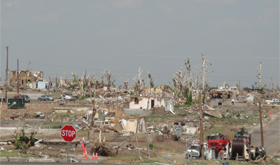 You can view the Rebuild Joplin Plan on the UMKC AUP+D website here.